The day has finally come, my friends. 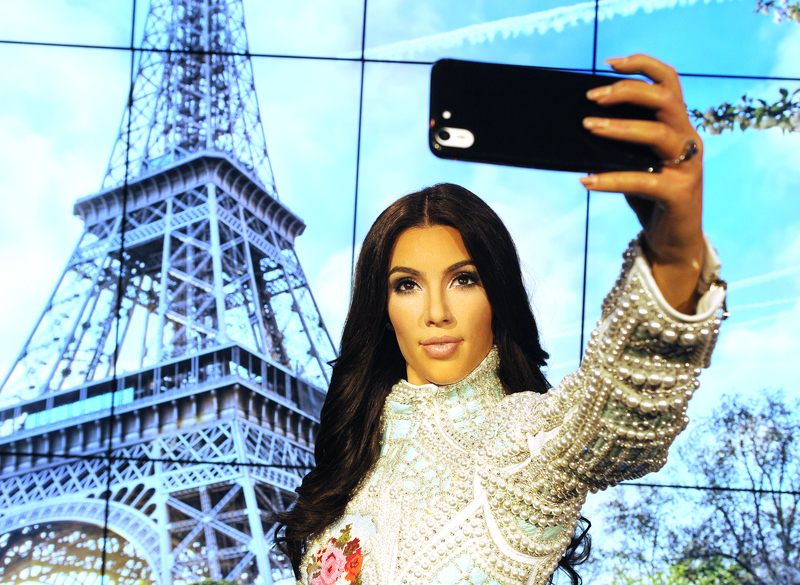 Kim Kardashian's proclivity for selfies? It's a permanent thing now. On Thursday, Madame Tussaud's revealed the UK take on Kim's wax figure, and the finished product is just about exactly what you think of when you picture Kim. She's wearing that super ornate Balmain dress she wore to her bachelorette party in Paris — aka the crazy gorgeous, really heavy looking dress that cost approximately $20,000 — and is standing in full selfie formation. The pose is pure Kim Kardashian, especially after she celebrated her love for selfies with her book, Selfish, earlier this year, but that's not even the best part about the figure. Nope, the best part is that Kim's statue is standing in front of a background that changes so that wax Kim is playing tourist in all kinds of locations. The bad news? None of these backgrounds are actually places Kim would go. OK, I take that back. A couple of these backgrounds feature places Kim would actually go, like the Eiffel Tower and the Taj Mahal. But in front of the corn dog stand at a fair? In a $20k Balmain dress? I don't think so. At an RV park?! Seriously, guys?! I thought this was supposed to be the second most realistic thing to, you know, actually taking a real selfie with the real Kim Kardashian. If we're gonna do this, if we're really going to give the world a statue of Kim taking a photo of herself in perpetuity, we as a society need to do this right. And in order to be 100 percent accurate? She should have been standing in front of these locales. Anyone who has watched Keeping Up With The Kardashians knows that Kim's favorite place to take selfies is wherever happens to be the least sensitive to the people around her, duh. This family loves Disney parks, and they're there all the time. Most recently, Kim celebrated North's second birthday at Disneyland, so I think it'd be appropriate to include her little girl and her favorite place in the lineup. With an optional Yeezy tour prop jacket for visitors to wear while they pretend to selfie with Kim. Bonus points if it includes Beyonce pretending not to be annoyed AF as North West is screaming beside her. God, I want to live Kim's life. Homegirl is always going somewhere, and she's always making the rest of us super jealous. Maybe with Willow Pape in the background, too? I'd totally be into it. Madame Tussaud's, please take note. The next time I'm England, these changes should be made. I've always wanted to take a selfie with Kim at Disneyland!